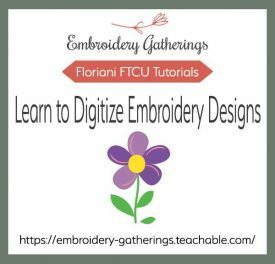 For those who are interested in learning to digitize embroidery designs with Floriani FTCU, we now have single individual classes available to help you learn to create your own embroidery designs. 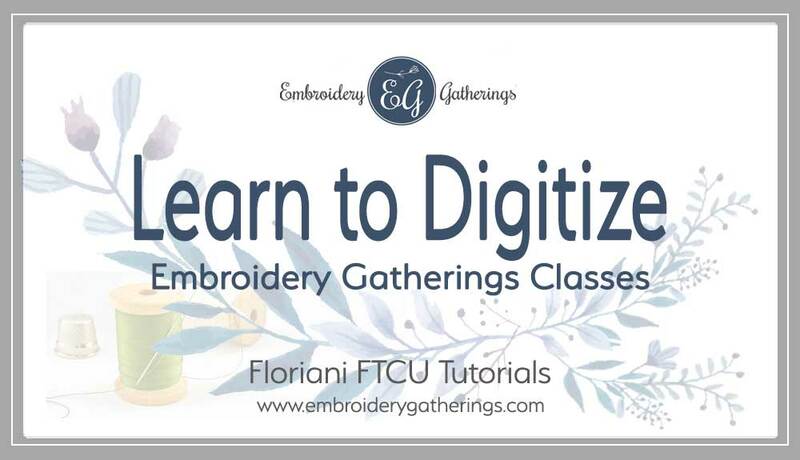 These new classes are for people who want to learn to digitize, but are not interested in joining the Embroidery Gatherings Membership Club. Although, if you seriously, want to learn to digitize, joining the Membership is the BEST choice. 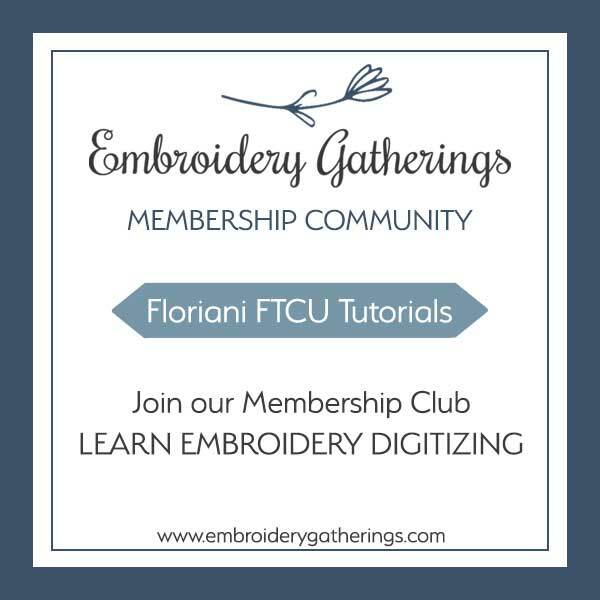 It has over 75 step-by-step lessons to help you learn to digitize with Floriani FTCU. You can find out more information HERE. For those who are looking just a few classes to get them started with FTCU, check out these digitizing classes. They are located on our Embroidery Gatherings Teachable.com site. The first video will show you how to plan your design to know the order in which to trace the shapes. It will also walk you through deciding which stitch tool to use for each shape of the design. During each of the following videos, you will learn to trace a run stitch, fill stitch and a satin stitch. The birdhouse is traced using the applique tool and then finish the design using the Text tool to create a Welcome message! 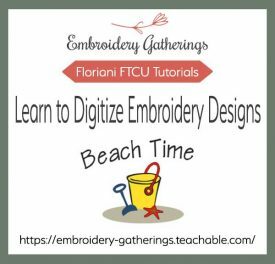 Click HERE to visit the Embroidery Gatherings school on Teachable.com and find out more about digitizing this design! This class shows you how to digitize this fun Beach design and then trace outlines to show off the shapes. The first video will show you how to plan your design to know the order in which to trace the shapes. It will also walk you through deciding which stitch tool to use for each shape of the design. During each of the following videos, you will trace the design using fill stitches and satin stitches and a shortcut technique for creating run stitch outlines around the shapes. This class focuses on when and why to use the Tie Commands when tracing your embroidery designs. The first video will show you how to plan your design to know the order in which to trace the shapes. It will also walk you through deciding which stitch tool to use for each shape of the design. During each of the following videos, you will trace the design using fill stitches and satin stitches and a practice setting the Tie Commands for each of the segments. Did you know that you could digitize True Type Fonts from your computer in Florian FTCU? This class will show you two ways to do that! It will also show you how to organize your favorite fonts and how to import fonts that you have purchased using the Font Importer Tool. 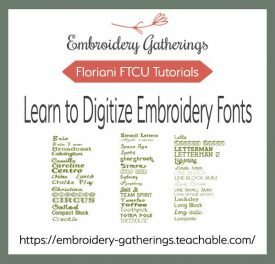 Click HERE to visit the Embroidery Gatherings school on Teachable.com and find out more about digitizing with these FTCU Font tools! And, for those who want MORE classes, you can always join the Embroidery Gatherings Membership Club HERE. We release new video tutorials at least 2x a month. There are over 75 written tutorials to download and practice as well as videos and new project lessons to grow your digitizing skills! 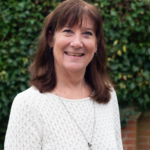 With the Membership Club, you can get one-on-one guidance and as much email support as you need to create your own embroidery designs for yourself or family and friends. If you have any questions, I am always happy to help you and guide you with whatever you need to learn to digitize with FTCU. You can email me at: paula@embroiderygatherings.com anytime! I read every email and will answer your email questions ASAP! 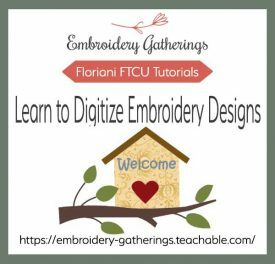 I hope you try one of these classes and that they give you the guidance and support you need to learn to create your own embroidery designs!